Do you remember the days of "dial-up"? The strange electronic white noise, the waiting to connect, and the painful process of wading through web pages? Nine million households in Britain have turned their backs on these slow internet connections, and switched to broadband, freeing up their phone and allowing them to really surf the web. As Google and eBay have become a bigger part of our lives, the business of delivering them to our homes has become more competitive. However, there is more to this than just consumer demand. 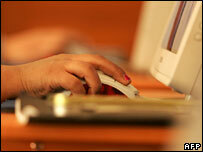 Last year, an important regulatory decision changed the way broadband is supplied. BT, which largely controls access to the internet via its copper wire telephone network, was told by Ofcom to open up its infrastructure to the competition. Other companies can now control the wire that runs from your telephone socket to the pole on your street, and on to the local exchange. The telecom term for this is "local loop unbundling", or LLU, and it sparked a process that has come to fruition with this summer's incredible boom in broadband offers. The first company to seize the LLU opportunity in earnest, by going beyond existing regional attempts, was Carphone Warehouse. It is known for being Britain's biggest mobile phone retailer, but its fixed line business Talk Talk has also been a success. 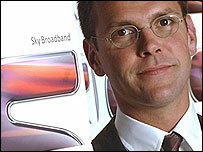 Its chief executive, Charles Dunstone, decided on a bold move into broadband internet. He wanted to change the conventional way people were billed for broadband. Previously, customers were charged separately telephone line rental and calls on the one hand, and internet connections on the other. If he could get control of the telephone wire into customers' homes, he would be able to offer a £21-a-month package that provided the first two - with broadband included in the cost. He turned this strategy into a bold marketing claim - his broadband was "free". In April this year, as the offer opened to the public, the Talk Talk website crashed under the weight of demand. Within days, the offer had created a media storm, and it was becoming clear that the 170,000 new customers Dunstone had banked on had been conservative. By June, he announced that 340,000 people had signed up for the offer. As the thermometer rose this summer, the broadband boom really took off. Take Southfield Close in Nuneaton, which according to broadband research consultants Point Topic is representative of the main trends in broadband take-up. The street, like some 50% of the UK, is on cable. NTL is the biggest supplier of broadband through their fibre-optic network. About 40% of the residents are already connected to broadband, which is slightly higher than the UK average. A feeding frenzy began, as big companies like O2 snapped up small and medium-sized internet suppliers. Mobile operator Orange absorbed internet service provider Wanadoo - also owned by Orange's parent, France Telecom - and shortly afterwards joined the "free" broadband bandwagon by offering it to customers on a £30 per month tariff. As with the Talk Talk deal, Orange were offering broadband as a kind of "loss leader", attracting customers with something "must-have" in return for tying them into a lengthy 18-month contract. For mobile and landline telephone companies, broadband had become a kind of Trojan horse to get into their homes. 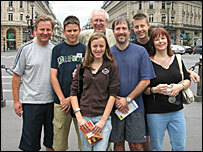 We have followed three families as they tried to find their way through the maze of new deals and offers. Chris Harris and his family found that the increased competition meant they could ditch their dial-up for broadband and still save money, but they also discovered there was a downside. Like others who signed up for the Talk Talk "free" broadband offer, Mr Harris found himself in a call centre queue, trying to find out why he had to wait for more than a month for the service. Mr Dunstone apologised and offered to speed up the process. However, confusion at the local BT exchange meant that at the end of July the Harris family were still without their broadband. Dave Wilson and family had already been on broadband for 3 years through NTL. Despite having their own cable network to pipe broadband into their customers' homes, NTL, which recently merged with Telewest, is not immune to the fierce competition in the broadband marketplace. Mr Wilson considered switching to the Orange "free" broadband offer, but was persuaded to stay with NTL after they offered him a large price cut. NTL has just announced a new package, offering broadband alongside TV, landline and mobile calls, which they hope will attract new customers, as well as hanging on to people like Mr Wilson. In June, the company launched Total Broadband, which includes lower introductory prices and things like virus checkers included in the price. 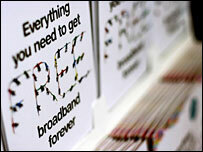 BT also showcased new broadband services, which it claims offers customers the broadband of the future. Key to the strategy is a new television service via broadband, still in the pipeline but due to launch in the autumn. We met up with Maureen Harrison as she tried out another BT broadband gadget - a videophone. She was attracted by being able to see as well as speak to her daughter and grandchildren, but was not keen on having to pay for separate BT subscriptions for her family. By mid July, Sky launched a much anticipated broadband offer of their own. Last year Sky's parent, BSkyB, acquired a broadband supplier called Easynet, which had expertise in gaining access to BT's broadband network. The BSkyB offer, under boss James Murdoch, continues the "free" theme by offering it to their TV subscribers as part of the package. However, only around a third of them get to receive this at present. Analysts believe that the summer of 2006 will be remembered not just for its scorching temperatures, but also as the coming of age of broadband Britain. The Money Programme: The Broadband Boom and You, BBC Two at 10pm on Wednesday 2 August. In Northern Ireland, BBC Two at 11.20pm.